The NEW Hivita Luminous White Collection consists of a two-phase system that works on brightening up your skin complexion. For those after a healthy and luminous glow for the skin, then be sure to check this range out. The two-phase system consists of a nutritional supplement and a skin renewal cream. When used in conjunction of each other, it can look to leave your skin looking much brighter as well as with having reduced redness, hyperpigmentation and fine lines in the skin. Most importantly, you get a boost of collagen for your skin which is essentially what gives you a healthy glow. So how did I find the products? 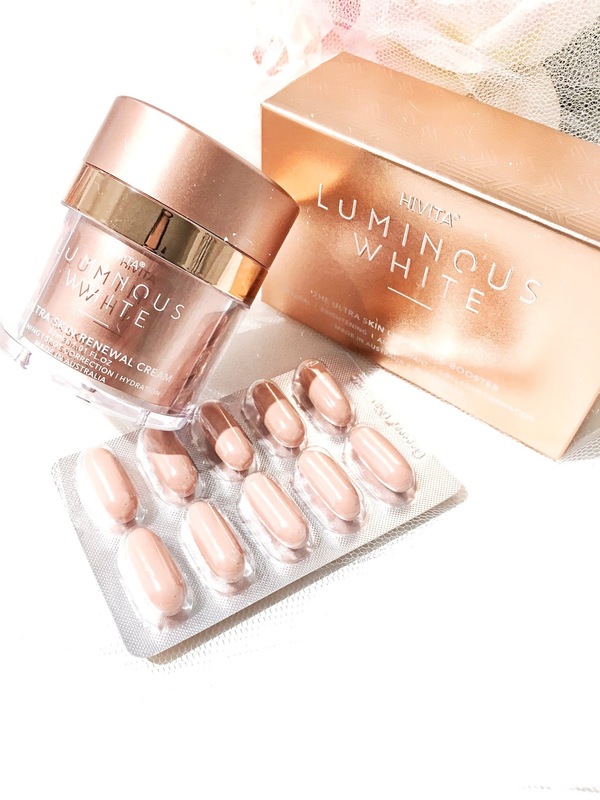 Luminous White Ultra Skin Lightening Booster, RRP $198 - So apparently this Australia's first ever supplement to be formulated with 100% patented phytoFLORAL (freeze dried white tomato rich in Phytoene and Phytofluene). By taking at least one capsule a day, you can look to benefit from having a brighter skin complexion, toned skin, reduced pigmentation and dark age spots as well as fine lines. By simply remembering to take one capsule a day, you can be rest assured that you're in the right path to achieving a healthier skin complexion. Luminous White Skin Renewal Cream, RRP $98 - Next, we have their Luminous White Skin Renewal Cream...which consists of a soft, velvety cream texture. By applying on this cream twice a day (both morning and night), you're looking to refine and create a smoother surface for your skin. This product has actually been formulated with skin-brightening ingredients such as Phytoene and Phytofluene. Overall, this duo is more suited to those looking to achieve a brighter skin complexion. The main focus is of course, skin brightening but it also helps to fight the ageing signs such as fine lines. After trying out both of these products, I could note that my complexion looked more healthier, toned and brighter looking. The HIVITA Luminous White Ultra Skin Whitening Collection (Includes the Ultra Skin Lightening Booster & The Skin Renewal Cream), RPP $298. It is available to purchase through independent pharmacies, otherwise it can be found via HIVITA's official website. Are you looking for that radiant skin glow?